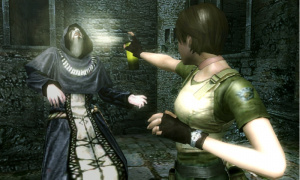 The news that Resident Evil: The Mercenaries 3D save data cannot be deleted sparked a frenzy worldwide, with rental companies and retailers working out the impact it'll have on their businesses. Major games retailer GameStop made the bold decision not to trade the game in from customers, but has now changed its corporate mind and will accept trade-ins from today. GameStop did ask the U.S. store base to stop accepting trades on Resident Evil: The Mercenaries 3D as we evaluated the save system for the game. Upon further review of the process with our publisher partner, Capcom, GameStop will resume taking trades on the game effective Wednesday, June 29. Capcom has been keen to stress that this move was not intended to combat pre-owned sales — for which the original publisher sees no revenue, of course — but we'd be surprised if the publisher was doing cartwheels at the announcement its game will be sold second-hand after all. That's fine and dandy that you can trade it in, but who in the hell would want to a buy a used copy since you can't delete the saved file? What's the point? I guess some people just don't care. Trade-in value will probably be $1 but then again that is approximately the amount that GameStop usually gives. Or more than likely: MANY people have no idea about this non-deletable-save-file fiasco. So... What was the reason Capcom was doing this in the first place again? The game has been removed from the Australian EBgames website. im guessing theyll just STEAL MY IDEA (nerd rage) and just corrupt the save file by taking out the game card while it saves making all the data get reset, the moment after it gets traded in. can get my copy friday morn not much money at mo but will put this one on the keeper shelf does anyone know if its just friends list for online coop or can you randomly search for players? Well, can you still play through the game from the beginning even with the save data? If so, not too big of a deal. I had no idea a single 3DS game release could have so much impact. Is it the suffering library of the system that causes this big backlash? Nah, it's the absurd design choice of the dev. One might ask "why does this matter? ", but with 99% of other games with delete-able files, most are asking "why ISN'T this possible?" Apparently Capcom didn't use the same tacit they did with SSFIV 3D, where we can save our progress on the SD card! I think they shot themselves in the foot with this one. I like how there's a massive market in the PC community that buys accounts for games so they don't have to level...granted, having the option would be nice, but I'm guessing there are some gamers out there that wouldn't mind buying a game with a bunch of stuff unlocked already. I'm not one of them...but then again, I buy new in 95% of cases. Having a game not be able to delete saved data is like having curtains on the Titanic. What's the point? Yay for Gamestop! Maybe next time, Capcom will think twice about not being able to delete save game data on there games. What about having an official way (device) to delete the savedata? i reset my save data this also proves a delete option was coded into the game as once i corrupted the data on my pc it says in game "do you want to delete save data and start a new game"